Until you get perfect grades on everything, there’s always room to improve as a student. If you’re hoping to improve on the things you accomplished last year, the tips here might help you make the strides you’re looking for. Knowing how you learn could help you become a better student and help you study more effectively. Visual learners might best benefit from reviewing flash cards or charts and diagrams that can be memorized visually. Auditory learners, on the other hand, learn through listening. These types of learners might prefer studying with a parent or friend, discussing learning material with the teacher or listening to recordings of reading assignments. Still another type of learners, kinesthetic learners, learn best through hands-on approaches and might have trouble sitting still for long periods of time. For full comprehension, of course, you should always read the entire chapter(s) assigned. But if you’re short on time, don’t throw the towel in just yet. Skim the summary chapter (most textbooks have one at the end of each chapter) and highlight the ideas that are unfamiliar. Look up key words throughout the chapter and commit to memorizing unfamiliar vocabulary. The SQ3R method was developed by an Ohio State University psychologist in the ‘40s, and it means Survey, Question, Read, Recite, and Review. Begin by surveying or scanning what you are about to learn. Continue by asking questions of yourself that should be answered by the reading. Take a break periodically, then, to recite what you have read. Try to repeat what you have learned in your own words, as this will make the material more relatable. Finally, review what you’ve just learned. Answer all of your questions and vocalize the material. Whether you’re an auditory or visual learner, it’s a good idea to take notes for later review. So much information might be presented in just one class period, and it’s tough to remember it all from memory. Kim’s last tip is especially important. You stand a better chance of actually learning the information in your notes if you look at them a little each day, every day. This repeated reading moves the information to your long-term memory so you know it. Try this method over cramming the night before a test (which is just jamming the information into your short-term memory, an unreliable place for it to be) and see how it works. It might be the key to not “going blank” during the test you studied so hard for the night before. Some people study better with a little background noise, whether supplied by a chatty coffee shop or your favorite tunes blaring through your iPod. That doesn’t mean all distractions are equal, though. If you’re studying on the computer, log out of Facebook and stop surfing the Web. It will take you twice as long to study and lower your concentration if you’re texting your pals the whole time. With so many things on your mind, it might be tough to sit still and commit a full hour to studying. 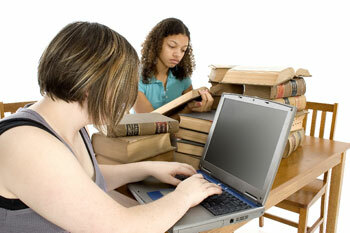 Research has shown that short bursts of studying might have more impact than a longer study session. Commit to a full 10 minutes of focused studying, then take a small break. Come back for 10 more, and you’ve already got a solid 20 minutes under your belt.